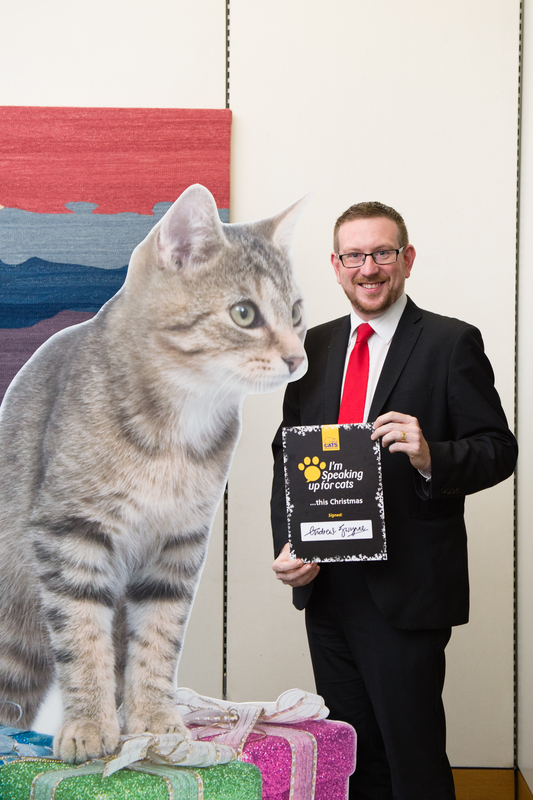 Andrew Gwynne MP joined the UK’s largest cat charity at a Christmas reception to highlight how politicians can improve the lives of one of the nation’s favourite pets. Politicians were treated to mince pies as they found out more about the charity, which helps over 205,000 cats every year through its network of over 250 volunteer-run branches and 32 centres. As well as rehoming cats, Cats Protection is the leading authority on cats and helps people better understand their needs. The charity also promotes and supports neutering as the only effective way to reduce the number of unwanted and abandoned cats. Earlier this year, the charity launched its Manifesto for Cats to outline a string of measures which would improve the lives of the UK’s estimated 11.1 million cats, including controlling the breeding and sale of cats, banning snares, and ensuring more owned cats are microchipped. “I am always pleased to support Cats Protection which does so much to improve feline welfare in the UK. That over 9,000 Cats Protection volunteers across the UK help take care of and rehome cats is tremendous. “It was great to see some familiar faces as well as some new MPs who were elected at the General Election in May. Twelve gifts a-giving Make sure that any toys you buy your cat for Christmas are feline-friendly. Choose ones with embroidered features as opposed to plastic and glass ones which can come off. If you get your cat edible gifts, only buy special pet treats. Eleven things a-choking Avoid using tinsel and ‘angel hair’ as these can get stuck in cats’ throats. If your tree is real, vacuum around it frequently – as well as being a choking hazard, pine needles can hurt cats’ feet and cause infections. Ten cords a-shocking Electrical cords for fairy lights could be mistaken for toys or prey, so keep them covered up to avoid disaster. Nine candles burning Keep candles out of your cat’s reach to avoid them being knocked over or causing him an injury. Eight gifts a-miaowing Never give cats as presents unless this has already been agreed with the recipient. It goes without saying that cats are a commitment beyond the festive season and are not to be treated as novelty gifts. Six baubles swinging Cats may well be tempted to tap dangling decorations, so it’s best to avoid glass baubles as they could shatter. Five dressed-up cats Do not be tempted to dress your cat up. You may think it makes him look ‘cute’, but he’ll only feel stressed. Four calling guests Having friends and relatives to visit is part and parcel of the Christmas period, but your cat may not wish to join in with the festivities. Ensure that he has a quiet room to himself with his food, water and litter tray easily accessible. Tree water hazards If you have a real tree, the base should be a no-go area for puss. The water may contain preservatives applied to the tree that are poisonous to cats. Cover up the base so he can’t get at it. Two turkey bones Restrict food treats to a small amount of boneless turkey for his Christmas dinner. Some rich foods – like chocolate – are toxic to cats and should definitely be off the menu.